Most folks have seen Casablanca so many times that, unless one happened to visit a theater in 1942, we don’t remember our first encounter with Rick and Ilsa. The film runs together as a nostalgic and romantic constant, a symbol for moviegoers everywhere of why we love the picture show. 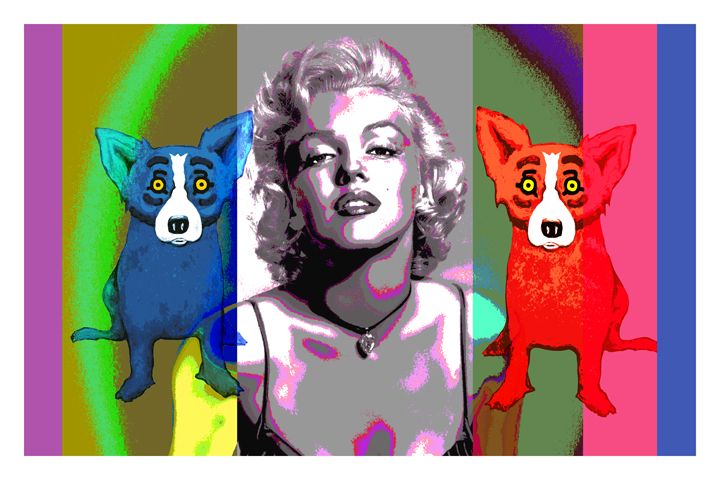 In his newest series, Hollywood Stars, artist George Rodrigue pays tribute to the Golden Age of Hollywood with unique, large-scale works on chrome featuring stars of the Silver Screen. Rodrigue’s Play it again, Sam depicts Rick and Ilsa who, ironically, never utter that most famous of movie lines. 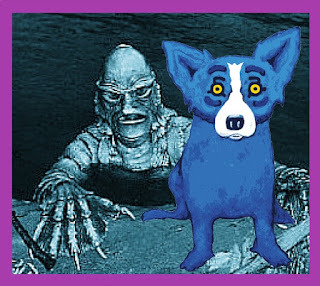 “I use the Blue Dog on either side of the figures, indicating one as their Hollywood image and the other as the real person behind the myth. Just as the dog has two sides, so do these actors, their true self and their screen self. After all these years, I should know better than to ask George about his favorite from this or any series. Yet I wasn’t willing to accept his standard answer, “the painting I’m working on now,” and pushed him. First reaction: scroll down, scream with laughter, squeal that there is no one else with that much talent who also has a sense of humor. Second reaction: say, hey, wait a minute, this is a gorgeous painting, encapsulating so much history; whew! Oh Patty, so perfect! Wait til you see what's coming. It kills me not to share it all at once. Here's a hint..... "Pillow Talk"! Eyeballs just popped completely out of head! First, great new work from George. His creativity is endless. Thanks for the kind words about BARONNE STREET. Coincidentally Casablanca is one of my favorite movies. One of my goals when writing the novel was to keep the dialogue sharp and witty like in Casablanca. The novel has another Bogart connection in that it is steeped in the tradition of the novels of Raymond Chandler and Dashiell Hammett. As you know, Bogart starred in the definitive film adaptions of their novels The Big Sleep and The Maltese Falcon. I read in your blog that your husband likes Rodin. 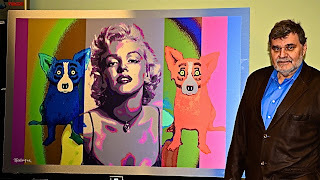 Check this out, there is a very good video on the page showing the exhibiton. Hope you enjoy! 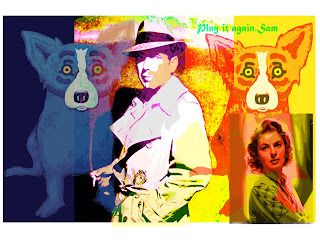 Loved watching Ilsa and Sam again. 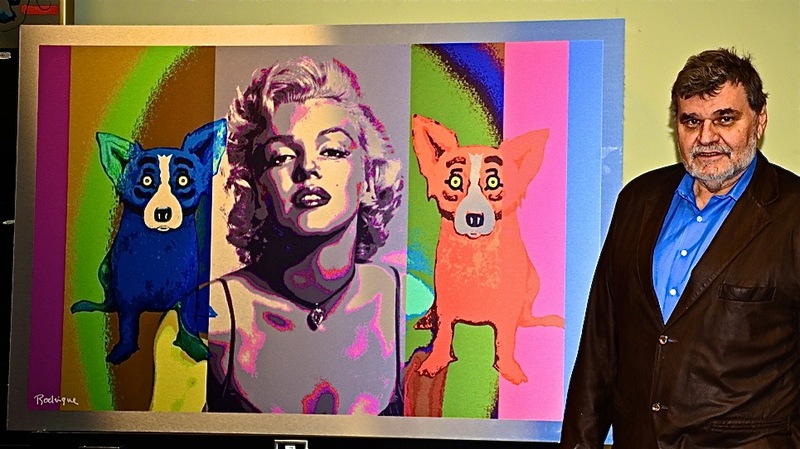 And oh, by the way, artwork on metal, LOVE IT! I have always thought that Rin Tin-Tin would make a nice companion for Tiffany!